Forty years ago, a dream was born in the mind of a young Montana cowboy who listened to the family lore of his grandfather owning big bay horses that carried themselves with grace while performing numerous tasks required on a family ranch back before tractors replaced horses in the hay fields. Being multipurpose, these horses could pull a mower all day long, or spend the day as a comfortable and tireless mount while scouring the mountains and coulees in search of cattle. Their size and substance made them ideally suited for the work on the ranch, but equally important were their intelligence and kind disposition. The young cowboy's mother spoke of these horses with such a genuine fondness, he was inspired to learn more. Thus began a 40-year quest to fulfill the dream of owning one of these critically endangered horses, the Cleveland Bay. 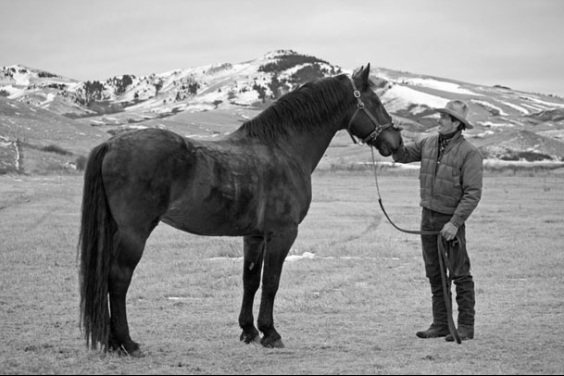 In the fall of 2011, Tregoyd William, a purebred Cleveland Bay, came to live in the Bear Paw Mountains of north central Montana. His first Montana foals born to the Brown family were welcomed in 2013. Although introducing Cleveland Bay lineage into our family's ranch horses has always been the goal, getting to know William gave rise to another cause that's now dear to us. William's many positive attributes convinced us we must do our part to help ensure the survival of these great horses. With fewer than 200 purebreds in the United States and only about 550 purebreds worldwide, it is important we help to contribute to the worlds pure population. We invite you to contact us or, better yet, come meet our Bays and see for yourself why we fell in love with the Cleveland Bay.